No, The Advantage Arms conversion kit for the Glock pistol is designed to fit and function on factory stock Glock receivers. Our kits were not designed for, nor do we indorse, using them on the Polymer 80% or any other aftermarket receiver. Are magazines and other parts in stock? Yes, magazines and parts are in stock. When will you have a kit available for the G26/G27 and G29/G30 Gen4 guns? No special kit required for the G26/G27 or G29/G30 Gen4 guns. Our L.E. 26/27 conversion kit will work on all G26 and G27 frames, including the Gen4. Our LE 29/30 conversion kit will work on all G29 and G30 frames, including the Gen4. Will the grey colored 15 round magazines made by another company work in my Advantage Arms conversion? No. From the feed back we're getting they do not work, lots of feeding issues reported. We offer our own 15 round magazine for use in our 17-22 and 19-23 kits. Our 15 and 25 round magazines require the use of CCI 40 grain round nose ammunition and are not recommended for the 26-27 kit. Can you tell me which dealer will have one of your kits in stock? Unfortunately, we cannot. We ship to a distributor, who then sells to the dealer, so we would have no way of knowing which dealers recently received kits. I wanted to purchase conversion kit directly from Advantage Arms, however, the website won't let me. Why is this? We have temporarily suspended Retail Sales for all of our conversion kits. This is being done while we get caught up with our distributor. During this time, anyone wishing to purchase a conversion kit, will need to do so through a dealer. We do not have an estimated date as to when retail sales will resume. Can I Dry Fire my conversion kit? 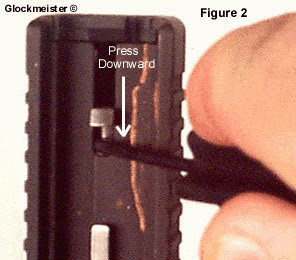 Dry Firing is not recommended and should only be done when it's required to remove the conversion slide from the frame. 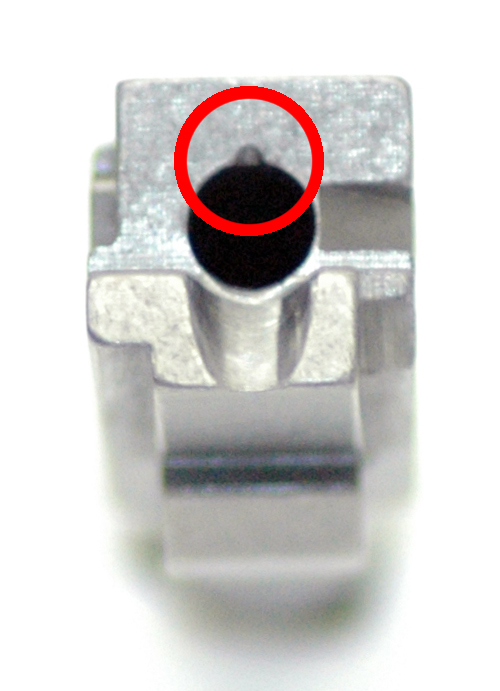 Excessive dry firing can damage the barrel and firing pin. We machine a small relief at the top of the chamber to help eliminate this problem. Click Here to see a picture of the relief. What type of ammo is recommended? Is there any ammo that you do not recommend? We do not recommend Stingers or any other Hyper velocity ammo. Also, the kits do not function very well with Federal bulk pack or PMC ammo. DO NOT use Remington Thunderbolts as they will lead up the barrel. We do not recommend any Winchester ammo. Click this link to view our Conversion Fit Chart. Do I need to lubricate my conversion kit? I'm having some issues with my kit not feeding or ejecting the rounds. What do you suggest? 1 - Use the recommended ammo. 2 - Your Glock should be factory stock. No aftermarket parts like the connector or trigger bar. 3 - Lubricate your kit, it will not function properly if you're shooting it dry. 4 - Watch for "limp wristing". 5 - Do not allow any portion of your hand to touch the slide while shooting. If I need to send my kit in for service, what should I send with it? How do I adjust my rear sight? To move the point of aim left, move the blade to the left by turning the windage screw clockwise. To lower the point of aim, move the blade lower using the elevation screw. The elevation screw will turn 360 degree's, moving the sight from its lowest point to its highest point. You will need to turn the elevation screw and watch closely to see what direction the sight is moving. Click Here for an illustration. I lost my instructions can you send me a replacement? Can I use Standard Velocity ammo in my conversion kit? Do you offer discounts to Law Enforcement Officers? Sorry, we do not discount. Can I replace the factory sights with my favorite after market sights? Yes. Our conversion kits will accept after market sights that have been designed to fit your Glock. Do I need to be a Law Enforcement member in order to purchase the L.E kit? I live outside of the United States, can I purchase one of your conversion kits directly from your company? No, we do not export. Does the L.E. kit come with adjustable sights? Yes. We use Glock style adjustable sights. Adjustable for both windage and elevation. Several of my friends and I would like to purchase the Advantage Arms conversion kit. Can we get a Group Purchase Discount? No. We only offer discounts to Dealers that have a current Federal Firearms License on file with our company. What type of accuracy can I expect from my conversion kit? Most of our customers report 2 inch groups at 25 yards. Can I get an extended barrel with a 1/2-28 thread on the muzzle end? What are the lengths of the extended/threaded barrels, including the chamber? I would like to purchase a conversion kit for my G22. Can I substitute an extended/threaded barrel for the standard one? No. The extended/threaded barrels must be purchased separately. I assembled my conversion kit incorrectly and now I can't get it off my gun. What do I do? This procedure assumes that the ejector was incorrectly installed. 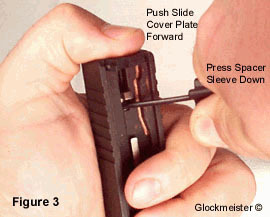 If the ejector is incorrectly installed it will keep the breech from closing and will disengage the firing pin from the trigger. 2. Pull the slide back and lock it open with the slide stop. of the slide. 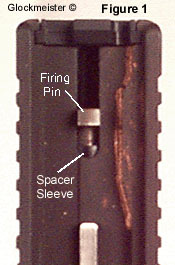 The sleeve is in front of the firing pin. See Picture 1.
the back of the slide. See Picture 2 and Picture 3. 6. Release the slide stop and slowly close the slide. barrel is tight you can open it up a bit with a flat bladed screwdriver. No. We are currently not making a kit for either of these models. We are currently selling a kit for the Gen 5. How do I pay for my return shipping on a repair. Click Here to make a payment for out of warranty repair shipping. This is only necessary if the kit is out of its warranty period, or the problem is not a manufacture defect. The shipping charge includes insurance and a signature required.